Corner Cottage is our holiday home in Polruan, Cornwall. It is not currently available for commercial holiday rental. Polruan is a small Cornish fishing village situated on the south coast, about 6 miles to the west of Polperro. 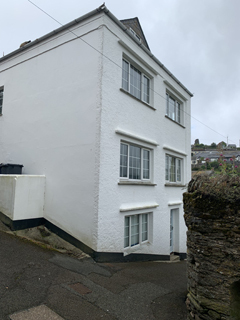 It is on the shore of the river Fowey, just opposite the town of Fowey and just before the river mouth. Polruan and Fowey form a small harbour area which provides shelter from the sea while at the same time being very close. It has been used as a working harbour for centuries and today still has a working shipyard, Tom's. Just down the river is a sizeable china clay works, which is served by large ships that come and go through the mouth of the river. 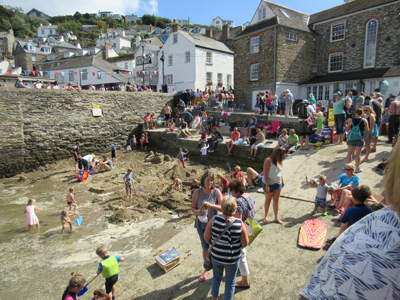 Polruan and Fowey are delightful places for a holiday. Peaceful, attractive and functioning at a pace which truly enables you to relax. Indeed you have to. It is well served for restaurants and pubs, indeed Polruan itself has two good pubs, the Lugger and the Russell, both of which serve excellent food. Fowey boasts many excellent pubs and restaurants and various interesting shops. Fowey is a popular location for sailing, having two very prestigious sailing clubs, which are active in a variety of events, including the annual regatta in August which attracts people from all over the country. Access by foot to Fowey from Polruan is easy via the regular ferry service from the quay. Polruan is close to Heligan, with its outstanding gardens providing a wealth of interest throughout the year. The Eden Project, one of England's most popular tourist attractions, is a few miles down the road near to St Austell. A particularly impressive National Trust attraction is Lanhydrock. The small fishing town of Polperro is just down the coast and served by buses from Polruan. Many other fascinating attractions in Cornwall are within sensible driving distance. As well as the pubs, Polruan has a well-stocked local shop providing groceries, as well as bread, newspapers and magazines. It has a good shop on the quay, The Winkle Picker, which includes the post office, an excellent cafe, Crumpets, and its sister shop Crumpets Too, selling home baked treats.